When I was tapped to curate the exhibit Word Shout Song: Lorenzo Dow Turner Connecting Communities through Language I did not know I was signing up for a wonderful adventure that would take me to some of the most interesting places I have visited so far in my life. One of these places was Sapelo Island in the Sea Islands of Georgia. 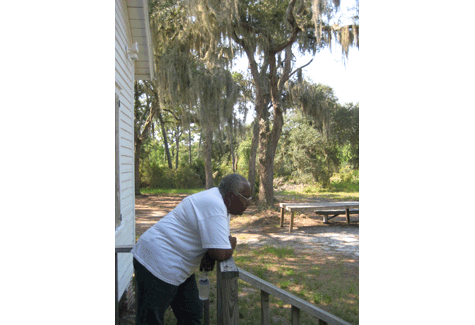 Dr. Turner had been to Sapelo Island in the 1930s interviewing several of the Gullah/Geechee residents. Note that I include the term Geechee here because I was told that people there prefer to be called Geechee. The bare facts about Sapelo Island today are that 97% of it is owned by the state of Georgia. It can be reached only by private plane or by boats or by the public ferry which boards on McIntosh County and takes twenty minutes to arrive on the island. But for me the real history of Sapelo Island was the history of the thousands of Africans and their descendants that toiled in its soil to produce cotton, corn, and sugar cane that enriched men such as Thomas Spalding, who was elected a senator for the state of Georgia. Spalding’s biography is easily found, but the biographies of most of the hundreds of slaves who made him a rich and successful man have been lost in time. Yet, the voices and memories of some of their descendants survive to this day, and that was the story I went looking for in Sapelo in September of 2010. The Anacostia Community Museum had received a cache of photographs in an envelope which identified them as being of Dr. Turner’s Gullah informants, but the photographs were not individually identified. I had looked at them, men and women posing in front of their houses, some dressed in very poor outfits, others looking sharp and prosperous. They looked back almost as if daring me to go out and find who they were and to retrieve their histories. That was what I had come to do at Sapelo when I stepped out of that ferry and met Cornelia Bailey, the leader of the Geechee on the island. Ms. Bailey received me well and took me to the inn she runs in Hog Hammock, the only remaining Geechee community on the island. 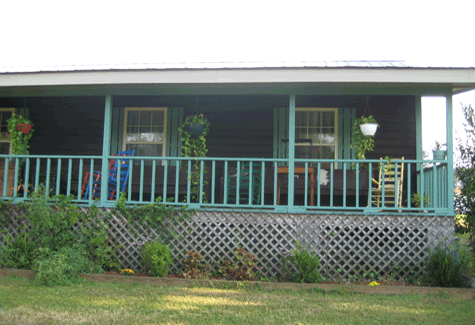 Her inn is situated exactly on the opposite side of the island where the plantation house, now a hotel, is located. On the ferry coming from McIntosh County I had noted a group of well-dressed, well-coifed ladies who were coming on holiday and who said they were staying at the hotel. I had previously arranged with Ms. Bailey to bring older people from the community to look at my photos. The sessions would be observed and eventually reported by the Smithsonian Magazine. A photographer came from Savannah specially to document the trip. On the morning following my arrival I sat at a table in the inn’s kitchen and talked with Ms. Bailey and Nettye Evans, one of the oldest surviving Geechee related to the island. But Ms. Evans does not live on Sapelo Island anymore. I found out that only fifty-five people live on Sapelo in the Hog Hammock community. Once more than fifteen communities existed, inhabited by African Americans, descendants of the slaves who had toiled on the plantation. But no more: today Ms. Bailey wakes up fretting over how few people are left. The older ones are dying or moving away to be cared for by their children. The younger ones leave to go to college and do not come back. There is nothing for them on Sapelo today. Ms. Evans and Ms. Bailey looked at the photographs and were able to identify at least two of them for me. One of them was of a well-dressed lady named Mary Hall. I immediately asked, “Why is she so dressed up?” And out came the story of a daughter who moved to New York but never forgot the mother she had left behind. According to Ms. Evans, who saw it all happening as a child, boxes and boxes arrived from New York containing clothes, shoes, and other gifts to Ms. Hall. The children would always hang around to see what the Post Office was going to bring at the times when there were deliveries. It was like Christmas all over again! Ms. Evans left us in late morning, but Ms. Bailey, the photographer, the reporter, and I went on to tour the island. Before we left for the tour the photographer asked Ms. Bailey to change into a red blouse, as it would contrast better with her dark skin. She, who had been so congenial and so polite, stiffened up and said abruptly that she did not like to wear red. We drove around the island with Ms. Bailey showing us where the Geechee settlements had been and how she thought Dr. Turner had managed to do his recordings. The old church at Raccoon Bluff—one of the settlements that had disappeared—which was now restored and back in use had owned a generator and that was probably where Dr. Turner had found the electricity for his very cumbersome 100-pound recording machine. Then, we went to Behavior Cemetery and it was there that the story behind Ms. Bailey’s aversion to the color red came to be told. As we walked around the graves and Ms. Bailey remembered people long gone, the story tumbled out from her mouth about how small African children were attracted from shore to the slave ships by the display of beautiful red cloths. Ms. Bailey’s usually impassive face showed a lot of emotion when she told this story, and my heart clinched at thinking of the horrible trick played so long ago which still echoed in the mind of this middle-aged grandmother. In the photograph which appeared with distinction in the Smithsonian Magazine story in March of 2011, Ms. Bailey is wearing a white blouse, and she looks regal and beautiful!